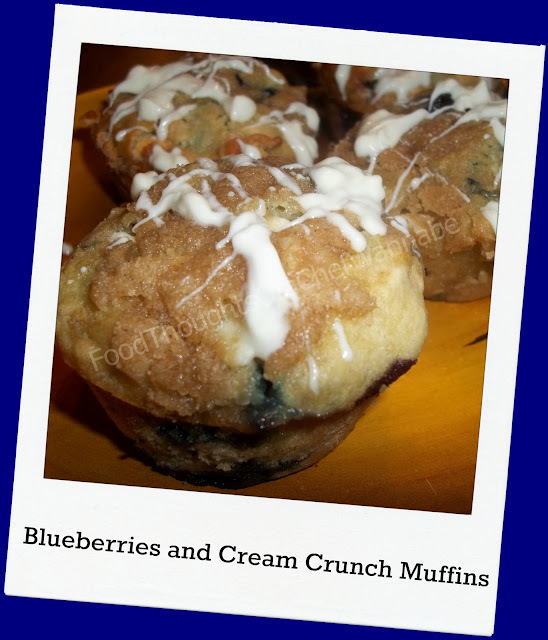 FoodThoughtsOfaChefWannabe: Blueberries and Cream Crunch Muffins! Blueberries and Cream Crunch Muffins! Hello friends, hoping this post finds you all happy and healthy! I have been in the mood for muffins. My husband has been asking for blueberry muffins. I will admit, until a year or so ago, I was a box blueberry muffin girl, who would doctor it up and add my own "stuff" and they were awesome. Well, a new day has come, and these muffins are INCREDIBLE. I had some ricotta I needed to use up, and some white chocolate chips I wanted to use so I took my base muffin recipe and went to town! Muffins are so versatile, aren't they? I mean, breakfast, brunch, snack, dessert, there is no craving they can't fulfill. They can be made ahead or frozen. I just love everything that is "muffins". However, I noticed I have only one muffin recipe up. So my husband asked me to make blueberries and cream muffins with a streusel top. So, for my adoring husband, who is the fizz in my soda........I present to you, the most amazing muffins we have ever eaten! Preheat your oven to 400 degrees. Mix all ingredients together. Using a well greased muffin tin, or using liners, fill each well with batter. This recipe will make 16-18 muffins. I made 12 regular sized, and 14 minis. Top each muffin with the streusel topping. (recipe below) Bake for 15-17 minutes. Mine took 15 exactly and the mini's took 7 minutes. Let cool in pan and enjoy! HINT, when you spray or line the cupcake pan, make sure to use nonstick spray for and spray the top surface so if the streusel bubbles up it will be easy to remove! Mix first three ingredients, and then cut the butter in to the mixture. You can melt a few white chocolate chips to drizzle over the top. If they don't melt thin enough add a few drops of vegetable oil so it will drizzle! I am SO trying this!!!! 4 tbsp. I had it written very confusing but I fixed it now! Thanks for asking and thank you for reading!